I want to mention a few items that have made our Vanagon road-tripping, particularly on long distance, multi-day/multi-week trips, much easier. 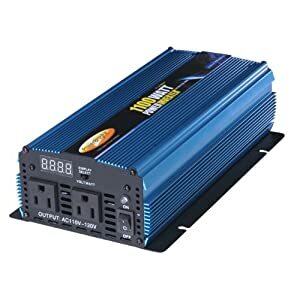 The first is the Power Bright 1100 Watt Inverter that I installed early this summer before our big cross-country voyage. I'm running the intverter from a new auxiliary battery that I added at that same time, using GoWesty's very helpful Auxiliary Battery Wiring Kit. This kit made wiring of the second battery and rerouting of the radio, cigarette lighter/12V DC, and interior lights from the main to the new battery a breeze. A note about pricing: While I certainly took GoWesty's advice on what specific power inverter and battery to choose, like other products (see my center console review), I found them much cheaper elsewhere. GW asks $134 plus $44 shipping (!) for the Power Patrol SLA1161 battery. I bought it at a local Interstate Battery dealer for $81. The same goes for the inverter. GW sells it for $95 plus shipping, I bought for $70 with free shipping. 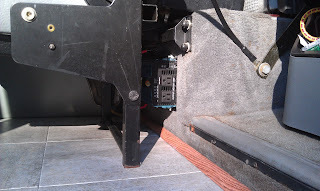 I installed the battery under the driver's seat and decided to mount the inverter against that battery box, where it inconspicuously lives below the rear-facing jumpseat. This required drilling holes through the box to mount the inverter and run the #6 gauge wire (purchased at West Marine) from the aux battery to the inverter. The manufacturer says that the inverter should be mounted horizontally, but I've had no issues with it in the vertical position. The digital LED display can be switched to read either remaining battery voltage or the wattage of whatever device(s) you're running. It's great having that battery meter at no additional charge. I'm not going to say much about the wiring of the new battery, because GoWesty really does a fantastic job of describing the process in the detailed instructions that come with the wiring kit. I enthusiastically recommend all of these products. Whether you're simply charging a laptop or whipping up frozen margaritas with your road trip blender, this combination will meet your power needs. I recently learned of an upcoming documentary film called The Bus. Based on the excellent trailer and teaser reels, it looks like filmmaker Damon Ristau does a wonderful job revealing the cultural, sentimental, social, and mythical realms of this internationally loved vehicle. "The Bus" Road Teaser from Damon Ristau on Vimeo. "The Bus" Trailer from Damon Ristau on Vimeo. I'll keep my fingers crossed for a nearby screening. The Somerville Theater or the Coolidge Corner Theater come to mind as perfect venues, and I get the sense that their ownership/management is of the type that would really enjoy this film.